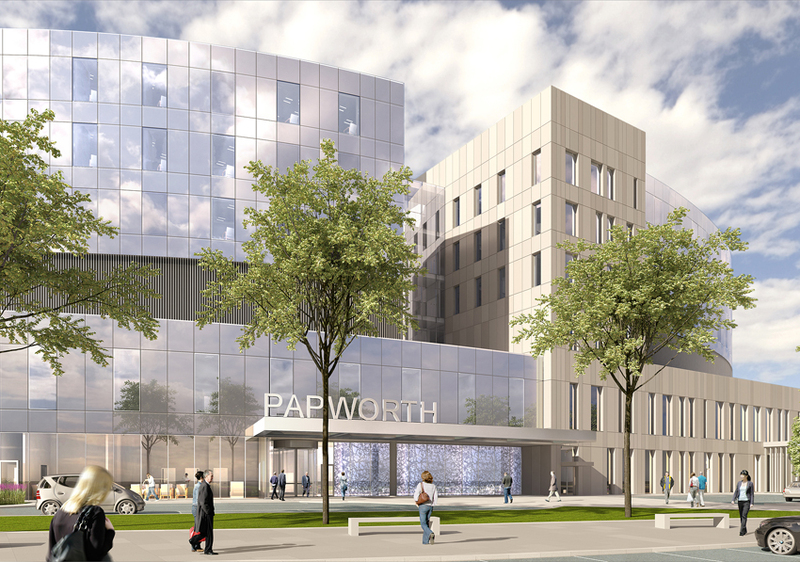 Papworth Hospital, which will cover a 40,000m² area when complete, will provide 300 beds, seven operating theatres and ﬁve catheterisation labs. Skanska were chosen to deliver the New Papworth Hospital, Cambridge, for the Papworth NHS Foundation Trust. The new hospital will provide patients, staff and the local community with a world-class healthcare facility. 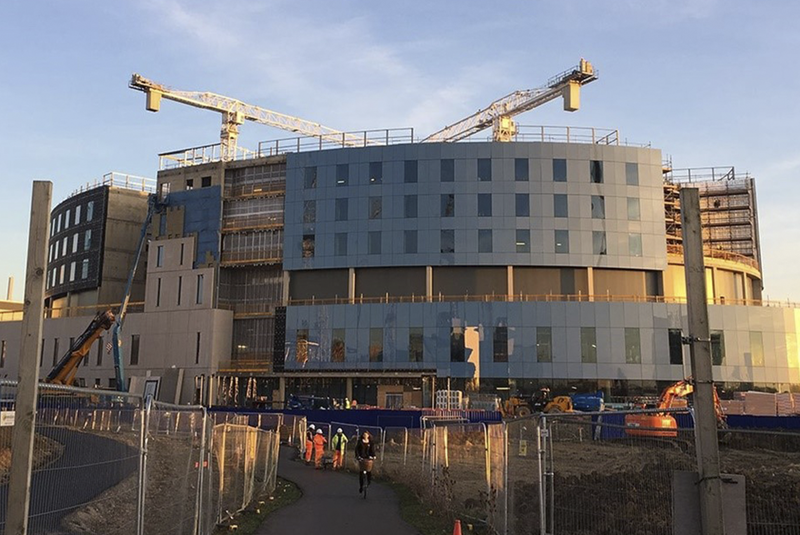 Skanska, with healthcare delivery expertise spread across its global network of projects, will provide Cambridgeshire with a hospital that is an exemplar of the facilities available to NHS patients and clinicians. The site for the new hospital is adjacent to the existing Addenbrooke’s Hospital, which is at the eastern boundary of the Papworth site. 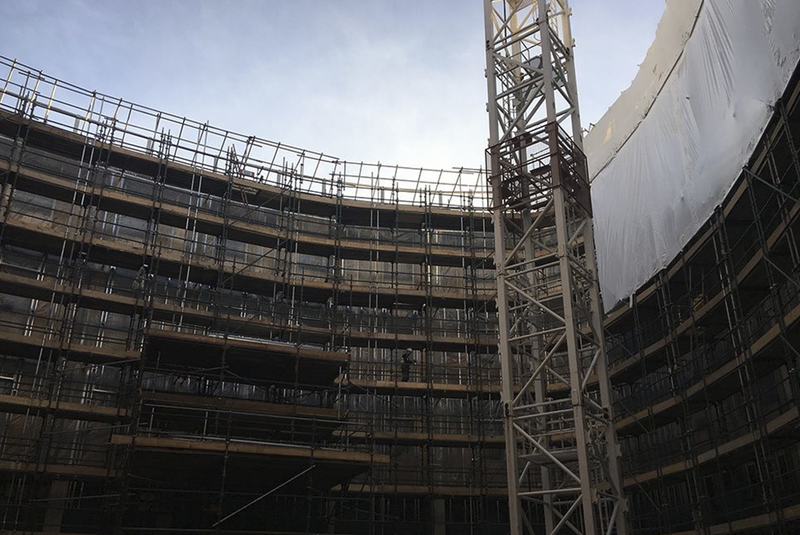 PHD supplied façade access scaffolding and Mast Climbers for the complex concrete frame and cladding installation. We also supplied temporary Layher System Staircases and handrails for the site ofﬁces. Installation of monoflex to the outside of the structures. The access scaffolding within the East and West Atriums had to be Free Standing. This was achieved with a bespoke tying system attached to the beams and then had monoflex installed to the outside of the structures. The structure then had to be dismantled lift by lift. We scheduled a programme for dismantling and erecting the scaffolding for each phase, saving the client time and money. Our design team collaborated with Skanska and engaged with the BIM programme to meet their objectives. We also employed local members of our workforce and upskilled them in line with our sustainability objectives and those of the client.